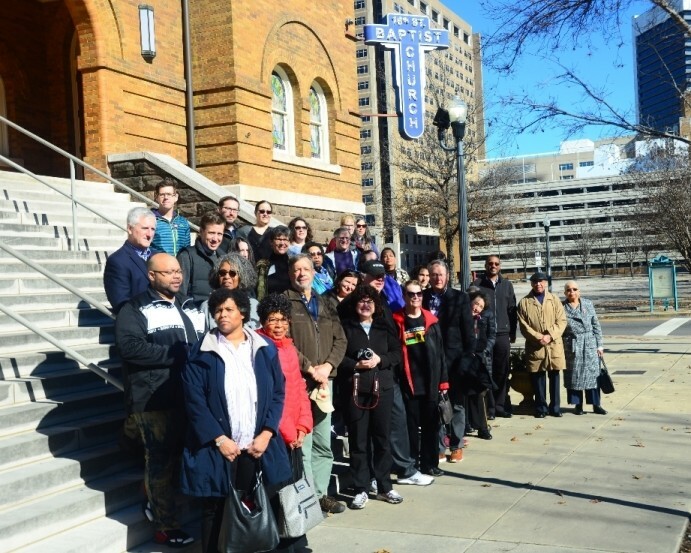 HARTFORD, CONN. (January 10, 2019) – A delegation of 36 Jews and Christians from Greater Hartford has just returned from retracing the historic footsteps of civil rights leaders from Montgomery, Alabama, to Selma and back. The Interfaith Freedom and Justice Ride 2019 traveled from Connecticut to Alabama to better understand each other and our nation’s troubled history of racism. Among the sites visited were the National Memorial for Peace and Justice in Montgomery, the first national memorial dedicated to the victims of lynching and racial prejudice; Selma’s Edmund Pettus Bridge, the site of Bloody Sunday, where more than 60 peaceful marchers were beaten by Selma police officers in 1965; and the 16th Street Baptist Church in Birmingham, where four young Black girls were killed in a KKK bombing attack in 1963. Not every stop on the four-day trip was solemn; participants also worshiped together at Temple Emanu-El in Birmingham and Unity United Church of Christ in Montgomery and shared meals and meaningful conversations. The delegation was spearheaded by the Jewish Federation Association of Connecticut (JFACT), the Jewish Federation of Greater Hartford’s Jewish Community Relations Council, the Connecticut Conference of the United Church of Christ, and Faith Congregational Church UCC and Immanuel Congregational Church UCC, both located in Hartford. It was intended to be a step toward building stronger local relationships between Jews and Christians, Blacks and whites. The group hopes to continue this work through joint advocacy and educational programs. “Judging by the comments I have received, those who participated in this ride for freedom were moved to embrace the work for justice that is ahead,” said Reverend Stephen W. Camp, Senior Pastor of Faith Congregational Church, UCC. Photo caption: Interfaith Freedom and Justice Ride participants outside 16th Street Baptist Church in Birmingham, Alabama, the site of a 1963 KKK bombing that killed four young Black girls. Click here to view a Facebook photo album from the trip.